Carl Barks' first oil paintings where made in a somewhat probing manner as could be expected because he had no experience or training at all. He made dozens of simple main motifs depicting rural landscapes, lifeless churches, ethnic Indians, and fairly uninteresting female portraits. The latter series of artwork had a tendency to occur in groups such as cowgirls, little girls, and young women. 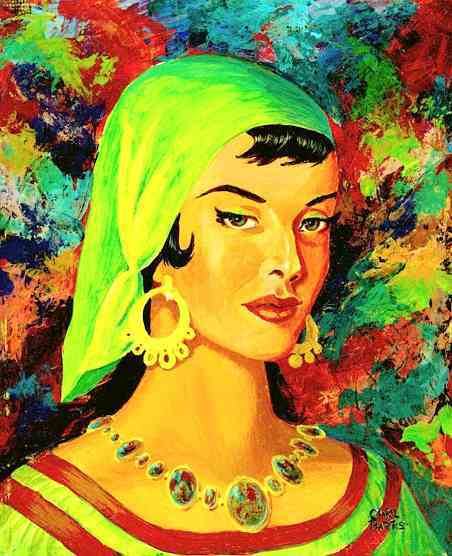 One of the paintings from the latter group was 15-67 Gypsy. It was the last of a batch with that theme. The artwork will serve as a common denominator for Barks' artwork of young women made en suite in 1967. All the young women portraits were made during the summer of 1967. Barks used oil paint with brush and a palate knife on Masonite, and he signed them in the lower right corners. 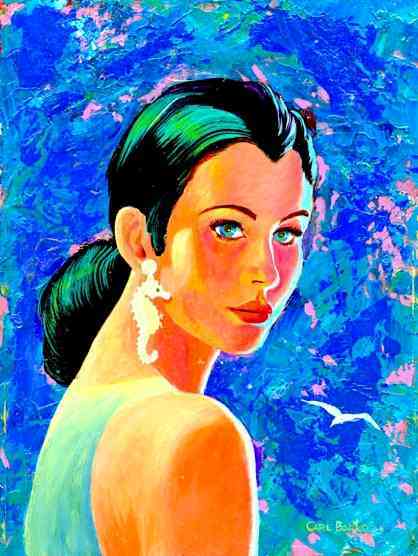 The size for 15-67 Gypsy was 8x10" (200x250mms). 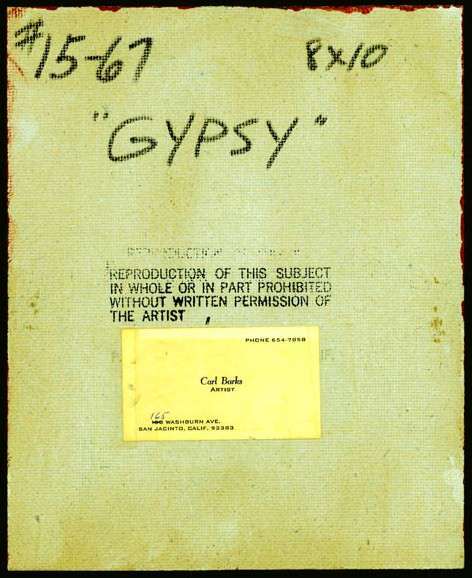 On the backside of the portraits Barks wrote his code number, the painting size, the title of the artwork, and a standard disclaimer. He also attached his business card for easy reference. In 1964 the Barks couple moved to West Washburn Avenue in San Jacinto north of Hemet, and this was the last relocation in the San Jacinto Valley area, before they moved to Oregon. The street number was 152 at the time but a year later it was changed to 165. Still, Barks kept his modest business cards - simply reading Artist for vocation - and only changed the street number by hand. This painting, along with the other young women paintings, were delivered in commission to the local branch of D.A.C. (Downtown Art Center), but Barks had to bring them home later as the gallery sold none. Some paintings of the series were only sold at Estate auctions after his death. As usual, Barks made several sketches of his painting motifs, and you are presented to three above (the first was made on paper, the rest on vellum). They are placed in chronological order, so you can see how he changed the motif slightly. On the second sketch Barks has scribbled Better for a 9x12 meaning that he had at some point planned it to be an 8x10 (which, incidentally, it ended up being). 11-67 Would You Believe Swedish? * Early on Barks decided to scrap the large painting thus rendering no additional records of it. ** Does not exist anymore in its original size as it was cut down (top and right) to 8x10 by the current owner. 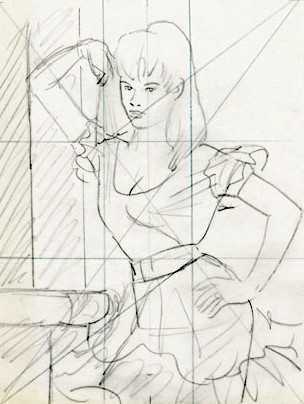 Among his extensive files Barks kept this rough sketch of an unknown woman. Although it is a full-figured portrait it can be speculated that it might depict another of the batch girls, in which case one of the first three seems to be the most plausible.